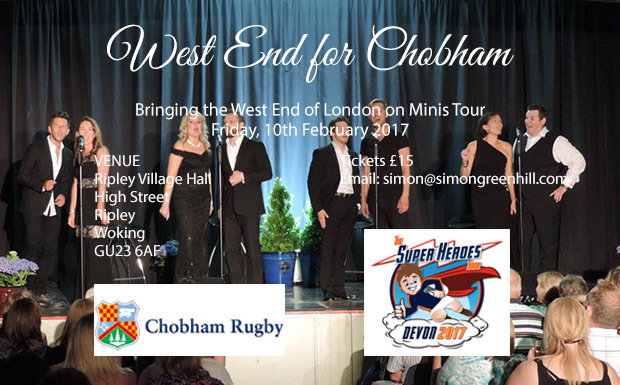 Simon Greenhill Entertainment is putting on a West End Musicals Extravaganza Evening in support of the 2017 Minis Tour to Devon. A number of Club Members will know of Simon’s talent from some of the impromptu appearances made at the Quiz night and after his turning out for the Seniors a few weeks ago to name but two. He has assembled a group of West End singers and actors he has worked with together with family members to entertain us for the evening. It really is a night not to be missed and very much open to the Club as a whole. Tickets are £15 and limited to 200. Cash bar and auction on the night. Please contact Simon directly to purchase tickets. simon@simongreenhill.com there will additionally be an opportunity to purchase tickets in person at the Club soon.